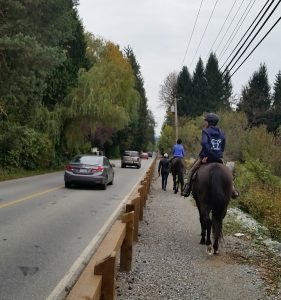 In response to concerns raised by the Alouette Valley Association and others, the (then) District of Maple Ridge committed to the consideration of management strategies along 132nd ave from 216th to 232nd streets. Urban Systems Ltd. was hired to put forward options and recommendations. This process and these recommendations were agreed upon by Urban Systems, Maple Ridge Engineering Department and Alouette Valley neighbourhood representatives NTAC (Neighborhood Transportation Advisory Committee). Safe space for pedestrians and bicycles. The multi-use trail along 132nd provides safety for most areas along 132nd but it remains dangerous for cyclists and pedestrians on the Edge St. Bridge as there is no safety guard. There is no safe linkage along 224th north of 132nd to 136th street. Both of these areas experience heavy usage by pedestrians, horses and cyclists enjoying the multiuse pathway as part of the loop into the Silver Valley development area. Safe space for horses. Areas of vulnerability still exist. See above. Slow traffic to the posted speed limit. Residents and users of the area are experiencing increasing incidents of reckless driving, speeding and road rage. The safety rail on the pathway has been broken down multiple times by such drivers. Passing is still common on the roadway, especially dangerous is passing ON the Edge Street Bridge and along the S curve. -Multi-use pathway installed between 216th and 232nd streets. Exceptions noted above. -Solid yellow no-passing line and signage, white paint on sides of 132nd to delineate lanes. -Safety barrier for cyclists at 132nd/224th corner. Since 2013 there has been very little work by the city on Phase 2. Since 2013 traffic has increased considerably and speeding and unsafe overtaking have become a way of life of life for 132 av. The fenced recreational trail has provided a degree of safety for residents and is very popular with a wide number of users from the neighbouring developments but is not slowing down traffic as much as hoped. Unfortunately, our expectation is that Phase 2 is still a very long way off and additional interim measures are now urgently needed to calm unsafe traffic on 132 ave and also 224 street. We are therefore once again petitioning the city to get something done. Members will be walking the immediate neighbourhood to gather signatures and we are also providing an online petition so that we can include the wider neighbourhood.